Although we would go up to the Catskills for Memorial Day Weekend to get our bungalow ready for the summer, we would not begin our true summer stay until Fourth of July weekend. On the east coast, school usually did not finish until the end of June, making the beginning of July the true start of summer. What a great time it was to be finally up in the Catskills. The weather in the City was already getting too warm, especially without air conditioning. All we could think about were the cool mornings and evenings of the mountains; the endless days of outdoor fun, swimming, boating, and just having fun with friends and cousins. But there was one sound of summer that we all dreaded. The sirens of summer were a portent of something bad happening. Whenever we heard the sirens go off from Kauneonga Lake, and saw the cars and pick up trucks carrying the volunteer firemen rush to the station, we knew something horrible had happened. It was not usually a fire. It was usually a boating accident or a drowning. My nephew waterskiing in a boat driven by cousins. Kauneonga Lake 2013. I remember the look on my mother’s face whenever the sirens went off. It was a mask of anguish. When I became old enough to go out on a boat with friends, she always told me to wear my life jacket; to be careful; and not to fool around. Every teen who drove a boat was supposed to take lessons and pass a driving test. The office was near the fire station. I remember going with friends as they went for the test. But I also know that many times, knowing the rules and following the rules were not the same. For instance, several of us were canoeing one day, when friends came by in their motor boat. They thought it was great fun to swamp us and make our canoe overturn and fill with water. Luckily we were not too far from the edge of the lake where we could touch bottom. I still remember lifting the canoe over our heads and walking it out of the lake. But honestly, the young adults I hung out with were usually very careful when out on the lake. We never had an accident or caused one. We might have done a few foolish things in our time, but we also knew that safety was important on the lake. They never cut off a person who was water skiing or got too close to another boat, unless we were going very slowly and met to meet up. Yes, we went fast sometimes, but in our day during the week, there were not that many boats on the lake. Unfortunately, not everyone follows the rules. And each summer, the sirens would go off. We knew that someone was in trouble. Eventually we would hear about a drowning or near drowning. We were thankful for the volunteers who took the time and effort to try a water rescue. Many of them were friends of my grandfather and father. So we often heard the entire story of what stupid fooling around caused the tragedy. With the Fourth of July here, I wish everyone a safe summer. Enjoy your time on the water. Boating is much fun. I still love the thrill of riding around the lake in a boat. I love the thrill of hitting the waves produced by other boats. But I always have a life jacket near by. I know that my cousins will take no unsafe risks. I pray that this year, no one has to hear the sirens of summer. When I was about six years old my father got us a dog. Sandy, a beautiful Cocker Spaniel, was so wonderful We were in the Catskills for the summer when Dad brought the dog to the bungalow. My brother and I were ecstatic. My sister was just a toddler, so I am not sure how she felt, but she seemed to love the dog as well. Her favorite game was to ride Sandy like a horse. Since she was so little, and Sandy so active, they both had a good time. My sister seems to remember that the horse riding was my idea. That could have been, I loved horses! We got to name him, because the dog’s given name was Harry, which was my grandfather’s name. So the first thing we did was have a family conference to name the dog. His name matched his color, a beautiful golden brown. 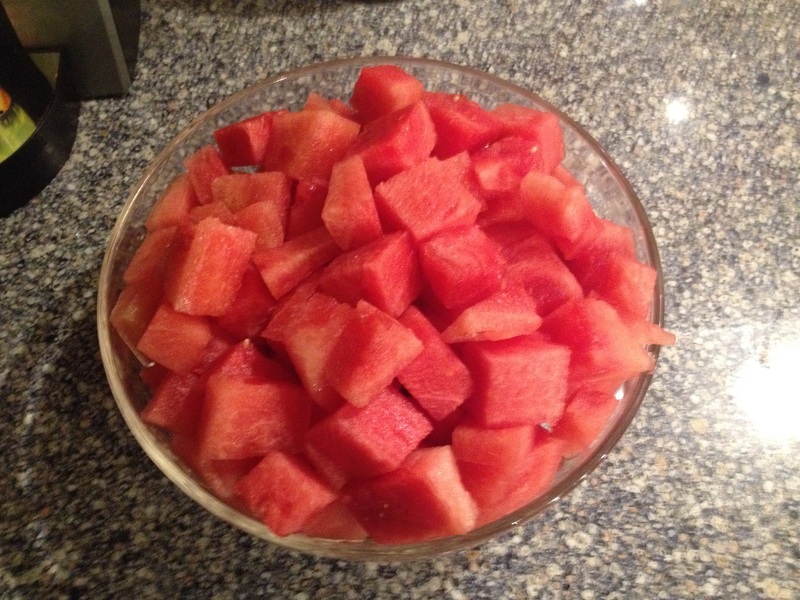 The summer was wonderful. It was easy to take Sandy on walks, and he had space to run around in the bungalow colony. But then Labor Day came and it was time to return to North Bergen. We lived in the second floor apartment of a three-story home on Third Avenue. Sandy was not as happy there as he had been in the Catskills, even though my brother, sister and I showered love on our dog. His adventures became mainly indoor adventuress; not great for an outdoor dog. In fact, my brother remembers that my parents would put Sandy in the bathroom at night, so he would not roam the apartment. One Sunday morning, my brother got up early and went to the bathroom. He found my young sister wrapping the dog in all the toilet paper! “What a mess to clean up as he ran around the apartment trailing toilet paper!” My brother remembered. Actually, overall, having a dog in our apartment was not going very well. My parents and my brother were usually the ones to walk him. It was a hassle to get him down the stairs and out to the street several times a day. My brother and I were in school. And my Mom was home with my sister, who was still sleeping in a crib. I think my Mom was getting very tired of dog ownership. That was the final straw for my Mom. Sandy had to go. “It was not safe to have a dog in the city. It was not fair to Sandy to be locked up in an apartment,” was what my parents told us. My brother tried to talk them out of giving Sandy away. He promised to walk him every day, if they let us keep our dog. But it did not help. Soon after that, my Dad found someone who had plenty of land to take Sandy. I still remember the day he came to take our pet. I hid Sandy under my sister’s crib and put the sides down. I put pillows all around to hide him. But it did not work. Sandy followed me out and left our lives forever. I remember crying for days, “I Want MY Sandy back! I want my Sandy BACK!” I am sure my crying and whining drove my parents crazy. But they were patient and explained over and over how this was better for the dog. Nothing worked. I never saw Sandy again. However, my parents did report back at least once, that he was loving his life on a farm. To this day, I cannot watch Disney’s “Lady and the Tramp” without thinking of my Sandy. This was my daughter’s favorite movie when she was a child. I watched it almost every day. Each time I watched I would think of my cocker spaniel. I have never owned a dog after Sandy. My husband and I always had cats. I think part of the reason for me, was that I never wanted a dog to pull someone in the street and be sent away. Cats stay indoors and care for themselves in many ways. It was just about five months that Sandy was in our family. He arrived in the early summer while we were in the Catskills and was gone by Hanukkah in North Bergen. Many times I wished I lived in the Catskills throughout the year so that we could have kept Sandy. In the Catskills Betsy, my doll, with my cousin who has finally made friends with her. I only have one toy left from my childhood. It is not that I purposely saved it because I loved it the best. I actually had other toys that I loved more. But this toy survived because of her journey to the Catskills. When my sister was born, I was gifted a large standing doll. The doll is over two and half feet tall. I did love her. And I believe I named her Betty or Betsy or perhaps Becky, which was what my Dad called my Mom, even though that was not her name. I kept her in my bedroom and I loved her! I remember when the doll arrived. She had a pink dress, light brown hair, pink shoes and socks. My Grandma Esther knitted her another beautiful pink dress. I enjoyed playing with her, but there was a problem. She was so big , I really could not cuddle with her. She was best for tea parties, playing school and perhaps discussing an issue. She seemed so real. And that was her biggest problem. Betsy was so real looking. During the day she was not a problem, but if you woke up in the middle of the night, she would be standing there staring at you with her big eyes open! My sister and I were used to her, but one of my cousins lived in fear of her. She was afraid to sleep when the doll was in the room. She really was too big for the apartment we lived in during the winters in New Jersey. So Betsy the doll moved up to our Catskill’s bungalow in Kauneonga Lake to be used only in the summer time. In the Catskills we had much more room to play. And she loved being up there. In time, Betsy moved from our bungalow to my maternal grandparent’s house, until one summer when she was gone. That is what happened with toys. They just disappeared when you outgrew them. I assumed she was given away. To be honest I don’t think I even looked for her. There is so much to do in the summer time. And Betsy was no longer an important part of my life. She lived in my memories. But my sister still had a relationship with Betsy. The doll was moved to the attic bedrooms of my grandparent’s Catskills winter home. My sister would play with her and see her when she went to visit in the winters. I was four years older, so while I was away at college, my sister was still spending time in the Catskills in the fall and winter. “Remember,” she told me, ”we did not go into the attic that much in the summer. ” Of course not…it was HOT up therein the summer, but wonderful in the winter. After my sister went away to college, the doll was put into a closet and eventually forgotten. At some point my grandparents moved her from a closet to one of the hidden nooks. But Betsy was not totally forgotten. We often talked about my big doll and how scary she was at night, or when you weren’t expecting to see her. We would remember the people who came in and were frightened the first time they saw her thinking she was a real toddler. Years later, when I was in my early 30s, after both my grandparents had passed away, my parents inherited the house in the Catskills. They started the process of cleaning it out. We all helped. I was assigned the two bedrooms in the attic, cleaning out the nooks that were hidden in the crawlspace walls of the bedrooms. Usually the doors into these spaces were covered by the beds. But we moved the beds away and went in to clean them out. I was surprised to find one perfectly clean except there, lying on the floor, was Betsy! She was a little ragged. Her clothes were gone. Her hair was a little messy. But she had survived, alone in that hidden space for years! I was excited. I now had a toddler daughter, and I thought she would love Betsy. I brought the doll downstairs. My mom, sister and I washed and cleaned her up. She needed clothing! My daughter wanted to give her some of her clothes, but we decided to buy her something just for her. The women (Mom, my sister, my daughter and I) went to the Apollo Mall in Monticello and we purchased a 2 Toddler dress. I also found her a beautiful pink straw hat. She looked refreshed and wonderful. Eventually the granddaughters gave her some lovely bracelets as well! It took us a while to decide where she would stay. No one wanted her in a bedroom. TOO scary. My parents decided to put her in the stone room, where new generation of girls began to play with her…the granddaughters. But she would not disturb anyone’s sleep. To this day, 25 years later, Betsy still stands in the stone room by the back door, which is the door that welcomes our guests. She has a purse; she has the same dress; she does not always wear her hat. She guards the door! Some people are startled when they first walk in. But she does not look so real anymore. However, my cousin, who was afraid of her as a child, still had a little fright when she entered the stone room and saw her for the first time as an adult. She had to share her scary Betsy stories. I think after the sharing, she was able to become friends with Betsy. My parents have both passed away. My siblings and I own the Catskills house. Betsy stands guard. She is a wonderful reminder of my childhood. It seems Betsy is a Patty Play Pal doll. Thanks to Maxene for the information. Excitement rules our home. Our milkweed plantings were successful. We have monarch butterfly caterpillars munching on the leaves. And thousands of eggs deposited among our milkweeds. We are doing our part to save the Monarch butterflies. We live in the path of the great Monarch migration. Each year millions of butterflies come through Kansas. When we see them, we celebrate. Our children, when they were young, would have such joy pointing to them and running to see the butterflies on our flowers. Our concern started because we noticed fewer and fewer butterflies making their way through our property. And then we watched a documentary on NOVA, “Journey of the Butterflies,” about the migration of the butterflies and how their natural habitat is diminishing. What could we do? 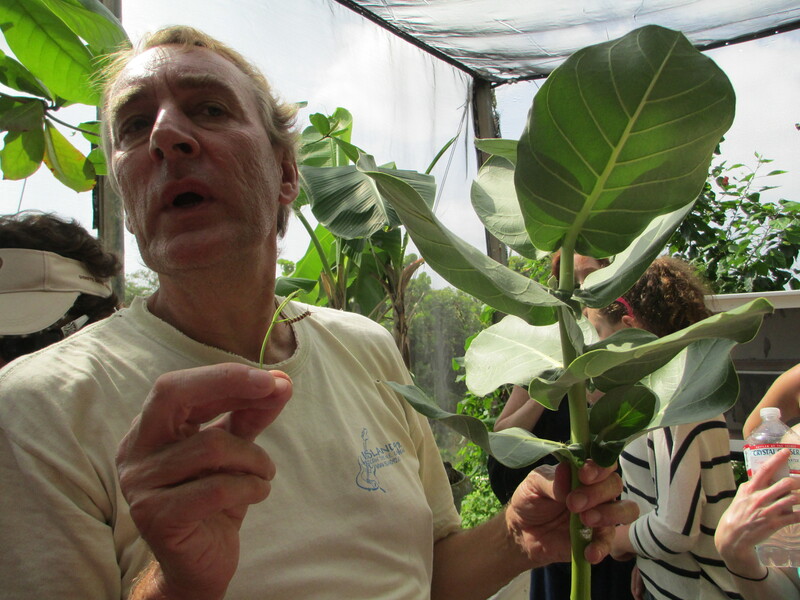 The docent at the Butterfly Farm in St. Maarten showing us a giant milkweed and a Monarch butterfly caterpillar. This got us started! That spring when we returned home, we had a mission. Years ago we had milkweed growing. And we pulled it all out. Now we knew that was a wrong decision. We needed milkweed. It was too late to start from seed. But we learned that the University of Kansas was selling milkweed in Lawrence. So I messaged my nephew, who was in school there, to please buy us some milkweed plants. He arrived the next day with five plants, one of each variety being sold at the event to save the butterflies. 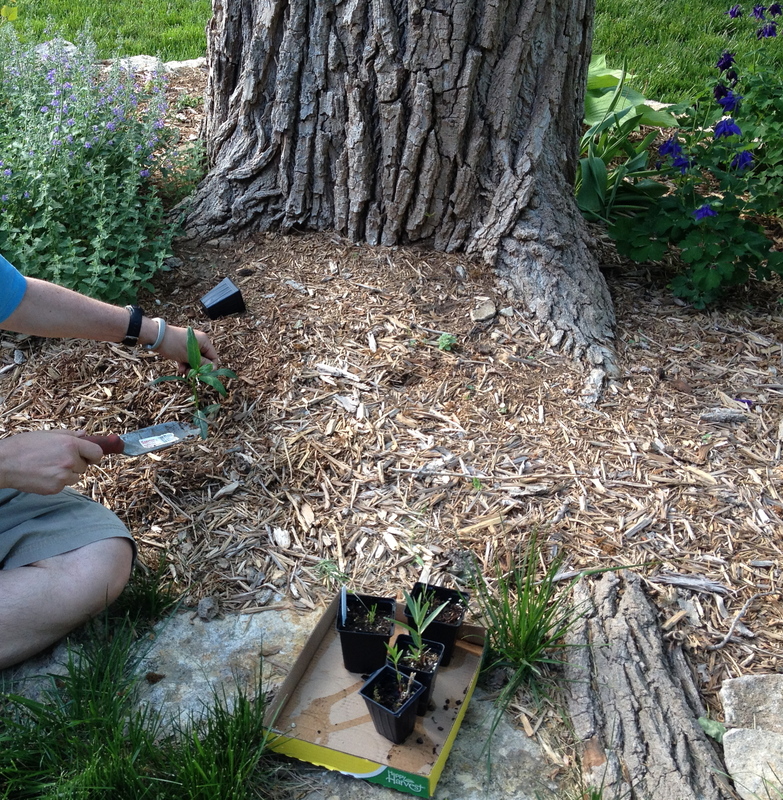 Planting the milkweed we got from the University of Kansas sale in 2014. But it wasn’t all gone. There was still one plant. But it was not enough. We never had any caterpillars last year. This year was different. My husband ordered 2,500 seeds on line. Yes, I said 2,500 milkweed seeds of five different varieties. I agree, a little over kill. I bought him seedling planters with 100 individual biodegradable cups. He planted over 200 seeds. And he waited. Soon they were sprouting. 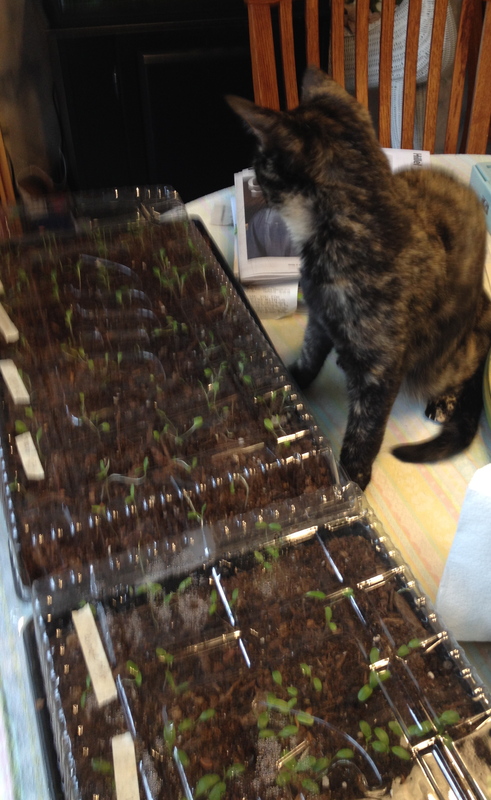 100s of milkweed seedlings watched over by our kitten. First we kept them on our kitchen table in the sunlight. But our kitten was a bit too interested in them. So we moved them to a bright spot where the kitten could not get to them. Over 100 seedlings survived. My husband pulled some out so that there was only one plant in each cup. And eventually he had 50 good plants to put into the ground. It was not easy to keep them alive. The animals loved to eat them, especially the bunnies. And the squirrels kept digging them up. He put the plants in our flower boxes with wire screens above them. Slowly he planted the surviving milkweed in the ground. He put up wire screens around his milkweed plantsto keep them safe. He also gave seeds away to our neighbors so they also could plant milkweed. His aim was sincere. Everyone should plant milkweed! Slowly the plants grew all summer. They did not flower, something was eating the flowers. And now the mature plants started to look badly. Something was eating his milkweed. He went out to investigate. And came back with a big smile on his face. Two of the four Monarch butterfly caterpillars eating our milkweed. Seen the wire screening we used to protect them in the background. Four caterpillars were eating the largest of our milkweed. We had done it! We had done a wonderful good deed! We had provided a home for the Monarch butterflies. Excitement and joy! 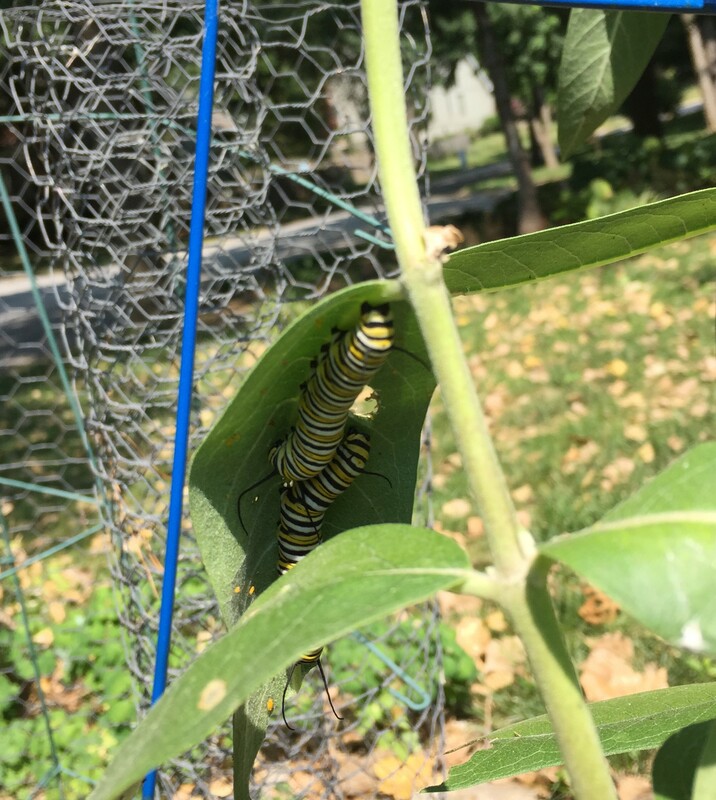 I expect next year we will have many more surviving milkweed plants and many more caterpillars because now we are experienced in the ways of saving the Monarch butterfly! Grandma Thelma was not a good loser. In fact, I would have to say that she hated to lose, especially at cards. It did not matter who she played with, a solitary game or against one of her grandchildren. Losing was not an option for grandma. She loved to play solitaire. And her endless days in the Catskills during the winter months gave her plenty of time to play. But she played even in the summer when there were many people up for the summer. Grandma would eagerly deal out her seven piles of cards and start a game. But if it wasn’t going well, she might add an eighth pile. Or perhaps count out her three cards in a slightly different manner. Or maybe check the cards that were turned over to see where the card was that she needed. She would then work to get that card uncovered. We would protest! “Grandma, That is cheating!” She always denied it. To her it was winning. Why play a game by yourself if you were going to lose? She said she was not cheating, she was just changing the rules. But rules are meant to be followed. Not to Grandma, if she had followed the rules, she once told me, she would not be here. She would have died in the Shoah. So you make the rules so that you win. To some degree I could not argue with that. However, there were times she would never make up her own rules. During the summertime daily canasta games with three longtime friends (including my other grandma), she played honestly. Doing anything else would have been a disaster. And when you play with a partner, it is much more difficult to make your own rules, since you both have to play as a team. But to be honest team work was not my Grandma’s strong point. She also never cheated during the weekly gin rummy game that the women of the colony played when the husbands were in the City. It was for money! A penny or two per point depending on the win. When she played for money, she always followed the official rules. But with her grandchildren, the three of us who spent the summers in the Catskills, she would often follow her own rules. Sometimes is was as simple as taking a peek at our hands. I admit we were a little lax on holding our cards close to our chest. But when playing gin rummy with Grandma, we learned quickly to keep our cards hidden. She would warn us once if we held our cards where she could see them. But if we made that mistake again, forget about it, she looked. On rainy days, when we were stuck inside for the entire day, my Mom would often ‘kick’ us out of the bungalow and send us across the lawn to our Grandparent’s house. They lived there throughout the year and had a television. But that was not our true reason for going. With our Grandparents we played cards or baked or just visited. The card games, however, were epic battles. They could go on for hours as we played gin rummy for points. Or perhaps a canasta game, the three grandchildren and Grandma. Or perhaps a canasta game for two. Hours of entertainment, And my Mom would get a break. My brother believes (and it is true) that she would rearrange the deck, stacking it in her favor, if you had to leave the room for a minute. I remember often calling for someone to watch Grandma while I ran to the bathroom.I would bring my cards with me, I knew that if I left my hand unattended, I would not win. Sometimes, if my brother or sister were around, I just asked one of them to play out the hand. You might think that she not a good role model by all this ‘cheating.’ But she really was so obvious about it, and never sneaky, that I am a little adverse to calling it cheating. We knew exactly what was happening. We knew she just did not like to lose, but at the same time she knew that she was not really winning.